After a rollercoaster week at Eco Fashion Week Australia, Port Douglas edition, I was as curious as a kangaroo to attend EFWA, Fremantle, Perth. 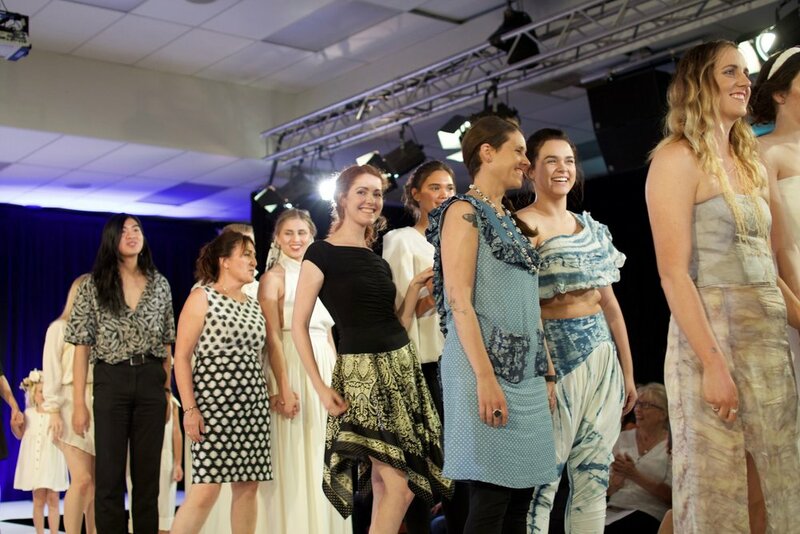 In case you’re confused, this year there are two separate eco fashion weeks: one in Port Douglas, and one in Perth. Here’s a very fancy and well drawn (hah) map to get you up to date: I’m the pink line. I travelled from Cairns after EFW Port Douglas, through Melbourne for a 3 hour layover, and onto Perth. With a three day break from shows under my belt, I was ready to head back into EFWA with a fresh mind and perspective. I had my fingers and toes crossed that attendance would be high, media coverage would be greater, and the huge efforts from the designers, makeup artists, hair stylists, organisers, and other volunteers would be witnessed and acknowledged by a crowd they deserve. The opening night saw a room full of bums on seats, and the energy on the runway was infectious. Just look at those smiles! The designers above were part of the Australian Merino Wool Design Awards. They were given three metres of merino fabric and approximately 4-6 weeks to turn it into a runway ready outfit. The results were impressive! 10 student designers and 6 eco designers, all created something totally different. It was astonishing to see how much you could do with the same fabric! Turns out, merino is incredibly versatile. A personal favourite was a piece by Caitlin Gerken, student and model in EWFA runways (and also my previous flatmate in our motel in Port Douglas!). Following on from the merino wool design awards, was the designer showcase: a glimpse into what to expect on the runway during the week. The dress below caught my attention immediately. Designed and made by Connally McDougall, all I could think was “that print though!” I later found out Connally McDougall is a Canadian designer and maker. 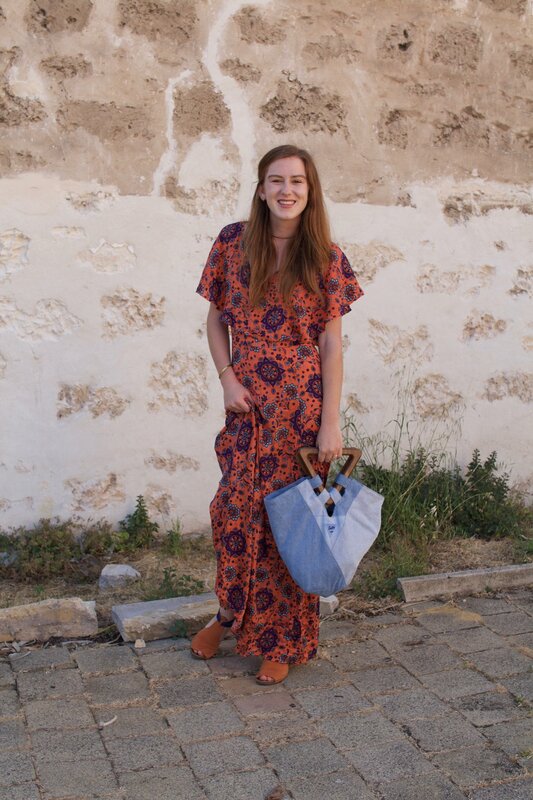 She uses recycled and natural fibres to create her garments, and goes to great efforts to maintain a zero-waste production line. They save every single scrap of thread and fabric, and turn it into stuffing. Nothing is wasted. During the designer showcase, I also spotted a few new designs (several designers from Port Douglas travelled to Perth, so we saw several designers twice) I’d been waiting for! Particularly, Francesca Phipps. Before Eco Fashion Week Australia, I had the pleasure of interviewing Francesca Phipps via email, about her multifunctional collection. It was exciting to see her clothes ‘in person’ for a quick glimpse before her full show later in the week. Check out those shorts! The opening night was a taste of what was to come, and it made me excited not only for the rest of the week, but the future of fashion. It’s your Fremantle, it’s your Australia, and it’s our world. Goodnight.